One of the few bright spots in an otherwise dismal April for the Twins has been the play of its bullpen. While not dominating, it has kept the team in several games despite a heavy workload. Without steady play from the relievers, 5-15 could be even worse. After pitching a scoreless 9th vs. Kansas City last night, Alex Burnett lowered his ERA to 0.77. The 3rd year reliever bounced between the big leagues and Triple A the past two years, pitching sporadically, mainly in mop-up duty. This year, he’s becoming a mainstay. Asked to pitch in more pressure-packed situations, the 24-year-old allowed just one earned run in 11 2/3 innings pitched over nine appearances. I had a quick chat with the Burnett as he prepared for Friday’s game. DZ: The team is struggling, but you are pitching real well right now. Can you talk about how personally, the season is going for you? BURNETT: It’s going good. I’ve just been throwing the ball over the plate, being aggressive with the hitters, attacking them and they’ve been putting the ball on the ground which is a good thing. DZ: This year you’ve been used a lot more in key situations. How much confidence does it give you knowing that Gardy and the staff has confidence in you? BURNETT: It gives me a lot of confidence. You go in there when the ball game is close, not necessarily winning, but close enough. Just to keep us in the ballgame, to go out there and get some outs and give our team a chance to win is what it’s all about. DZ: Is there a different feel for you this year, do you feel like you belong more? BURNETT: I definitely feel like I belong and it also makes it a lot easier when I am actually contributing to help the team win rather than when the game’s blown out of the water. I definitely have confidence in myself and confidence in everyone down there in that bullpen. We jell very well together down there. That makes it a lot easier. DZ: There have been a lot of changes (in the bullpen) the past couple of years…you’ve been around here longer than a lot of these guys. Is that kind of a different role for you, being more of a veteran? BURNETT: I wouldn’t consider myself a veteran. There are some guys down in the ‘pen who have pitched with other teams for awhile. They come in here and we all get along very well. That makes it easy down in the bullpen, there is no butting heads down there, we are all having a good time. DZ: Going back to spring training, having that service time last year, was there a different feel for you, a little more security? BURNETT: Coming in I felt I had a leg up, but you never know going into spring training. The way that I performed in spring training, I didn’t earn a spot to be here. They stuck with me and had faith that when the lights came on in the regular season, things would go better and they did. I am just glad to be here. DZ: Were you pretty nervous during cut down time? BURNETT: I wasn’t nervous, I was just going along with whatever happens. Like I said, I didn’t pitch well enough in spring training to earn a spot, so whatever they felt was better for the team was going to happen. 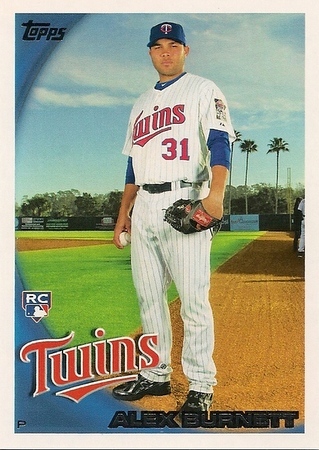 This entry was posted on Saturday, April 28th, 2012 at 11:46 am	and is filed under MLB, Twins. You can follow any responses to this entry through the RSS 2.0 feed. You can leave a response, or trackback from your own site.